|Ai-|Ais Richtersveld Transfrontier Park – Travel Guide, Map & More! |Ai-|Ais/Richtersveld Transfrontier Park spans both South Africa and Namibia and has to some of the most spectacular desert mountain scenery in Africa. The park is mainly a scenic wilderness destination, and wildlife viewing isn't the main focus since it has a low density of large animals, although it's the world's only area classified as an arid biodiversity hotspot. In Namibia, it features the extraordinary Fish River Canyon, the world's second largest canyon and one of southern Africa’s premier hiking destinations. 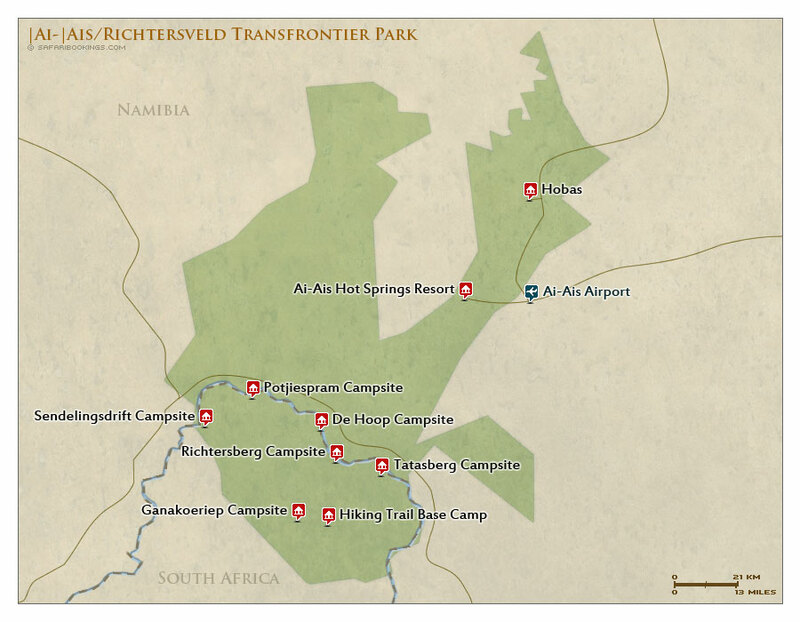 The |Ai-|Ais/Richtersveld Transfrontier Park is not really a wildlife destination. 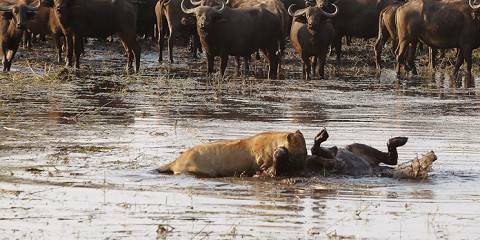 Wildlife is very sparse and most big safari animals aren't present. The rare, localized Hartmann's mountain zebra can sometimes be spotted. Small creatures to look out for are suricate, rock hyrax and ground squirrel. Caracal thrives in the rocky habitat but is seldom seen. 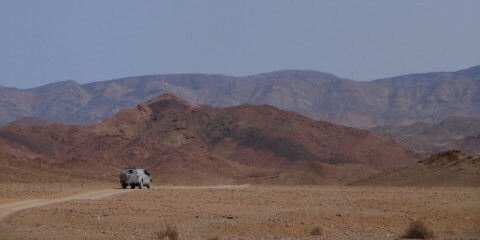 The mountain desert landscape is rugged and spectacular. The Fish River Canyon is the most dramatic feature in the park and meanders between spectacular steep cliffs that bisect the flat Namib plateau. The |Ai-|Ais Hot Springs are found in the south of the canyon. The Richtersveld National Park lies in one of the most diverse parts of the species-rich Succulent Karoo biome (large community of flora and fauna), renowned for its massive display of flowers in spring. Summer in |Ai-|Ais/Richtersveld, which lasts from October through April, can be a brutal affair. The average daytime temperature tends to stick around 28°C/82°F in the hottest of these months, but it occasionally shoots up to 45°C/113°F – sometimes higher. And unlike most other South African parks in the summer, there’s barely any rainfall to counter the heat. Winter (May to September) is much milder during the day, though it can be freezing at night. Avoid the hottest months of the year (October to April), when the park gets overcooked. The cooler period (May to September) is a much better time to visit. This is also when wildflowers color in the landscape. There’s little wildlife watching in |Ai-|Ais/Richtersveld, so this isn’t really a factor in the timing of your visit. Unless you’re a birder, in which case a visit in the heat is unavoidable. Want to Visit |Ai-|Ais Richtersveld TP? Again the very natural beauty abounds. Man has not destroyed what nature has created.